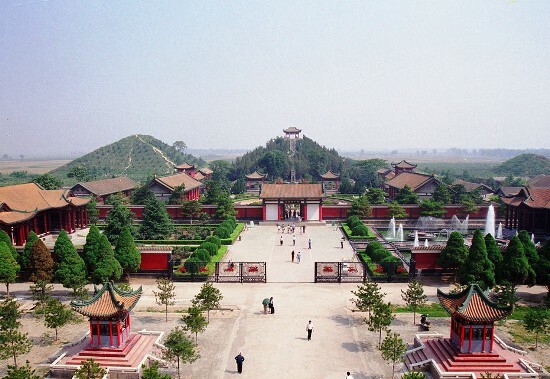 Located in the area of Duima of Weibei Highland, nine km northeast of Xingping County and 40 km from Xi'an, Maoling (茂陵), the mausoleum of Emperor Wu Di of Western Han Dynasty is most known as the largest of the five mausoleums. A current actual measurement shows that Maoling is 46.5 meters high, 39.5 meters from east to west, 35.5 meters from north to south on the top and 240 meters long at the base of the tomb. The tomb mound narrows to a flat top from a larger base in a trapezoidal form symbolizing solemnity and stability. Buildings were erected both inside and outside the mausoleum. Residences of high officials formed the innermost ring around the tomb of Emperor Wu Di while large numbers of rich and powerful people were located outside. Palaces, bed-halls and residential structures for maids and tomb guards packed the mausoleum. - Hours: 8 a.m. - 5: 30 p.m.